Each year we compile a comprehensive list of the best ways to find information about a phone number, whether it be a name, an address, or any other type of information you could need. The internet is a vast space with tons of information, you just need to know where to look! Most of these methods are completely free and available without needing anything special, some do require a social media account or require you download an app on your smartphone, but we will list any requirements at the beginning of the method so that you can find the right one for your specific situation. In this year’s list, we are going to be relying heavily on social media methods, which have proved to be a very valuable tool in finding out owners of phone numbers. People tend to share a lot of information on social media, and a phone number is commonly the most-shared piece of information on many sites. We are also going to dive deep into some of our older methods, like phone directories and white pages – since the online versions of these tools have come leaps and bounds over the past few years. Social media has evolved from being able to connect to people you know, to connect to people you may not know – and the algorithms behind this change constantly takes into account different pieces of personal information, such as a phone number, to match you to potential “connections”. You can use these algorithms through social media to find people from their phone number, even if you have never met the person before or had any prior contact. For example, if you’re using the popular messaging app WhatsApp – you can look up the phone number through the global directory and add WhatsApp users based solely on their phone number, no other information needed. The WhatsApp profile of the user you are trying to lookup may be exactly what you need! It usually contains the user’s first and last name, along with additional information as well. This method requires a bit of luck, and takes advantage of another tool that we talked about in this article: How to use SpyDialer to lookup a phone number. Essentially how this works is that you can use an online tool to call the phone number that called you, and then you’ll be sent straight to voicemail without the other user noticing that they received a call. If the person who called you has a voicemail setup, you’ll be able to listen to their greeting, without them knowing, and can then determine if you know them or not. If you get really lucky, the person inside their voicemail may even say their name. This makes it really easy to figure out who called, without the embarrassment of having to call them or text to them back to ask! Lots of people are in college or University in each state, and depending on the area code, it can be very easy to determine the state where the number called you. Once you know the state that the phone number is from, all it takes is a quick search of a school directory to check through hundreds of thousands of records, and usually the school directories are open to the public! Most of the time you don’t even need to be a current or past student at the school in oder to use the directory, which makes this method so much more useful. Check out the school directory search guide for more information on this method and an example search you can use yourself. School directories have been a common source for paid phone lookup services because of the vast information that they provide. 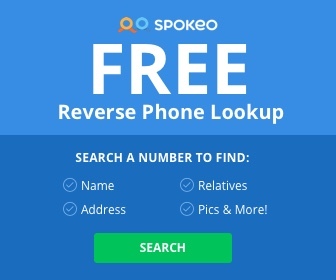 If you’re curious about where the rest of the information comes from in popular (paid) phone lookup services, look no further than this article, where we look into the sources used for popular reverse phone number lookup services like Spokeo and Intellius. You can use an online free phone directory like this list of five phone directories to find phone numbers that have been reported by other users, making it very easy to determine if the number who called is legit or just a scammer or telemarketer. Usually these lists are very popular and updated regularly, so there are good chances that you are not the only one who is seeking information about the same phone number that may be already reported on the site. Some websites even let you make comments and rate the phone number so that you can know additional details, like what the caller is trying to sell, or the name and address of the caller themselves. If you’re concerned that you might be falling for a scam or being taken advantage of, these directory websites are usually a clear indicator if the number is associated with frauds or scams because other users will report the numbers’ activity and behavior, allowing you to make an informed decision to continue or cut off contact with the caller completely. Many popular applications are popping up these days with the sole function of finding and identifying phone numbers that are called or have called you. 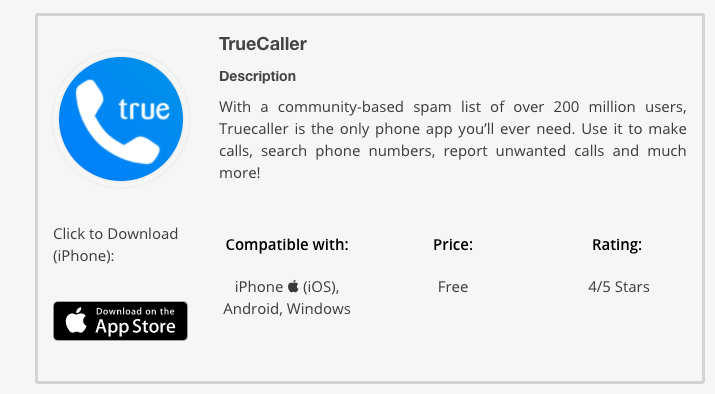 One of those apps, TrueCaller, is a free app on iPhone, Windows, and Android phones. It’s database consists of over 200 million phone numbers, and a comprehensive spam identifier that notifies you if a spammer or telemarketer is trying to call. The best part about it? It’s completely free! There is a paid version that needs to be unlocked if you’re doing a lot of phone number lookups, but for the average user you’ll be able to get great use out of it each month. Google should be your first stop at finding a phone number, but sometimes it can be tricky to weed through the results and find the number you’re looking for. Luckily, Google makes it easy to specify an exact search, through the use of quotation marks. Take a look at the photo below to see how it’s possible to tell Google to only search for the exact match of your phone number – no more false positives, if a webpage has the number exactly the way you typed it within the parenthesis, it will only return relevant results. You can also try this method using other search engines besides Google, but they may have a different way to specify searches other than the parentheses. It’s also important not to trust just the first page of the search results, usually the most valuable information is on the second or third pages that are lesser known websites which may contain information about the phone number you are searching for. It’s important not to discredit these results! If you know the phone carrier that the unknown number is using (if you don’t, it’s very easy to find out), then you can use that information to leverage the phone carriers and their tools to lookup a phone number. Many of the major carriers (especially carriers in the United States) have various ways to help you lookup the identity of a phone number, and will even investigate a phone number (for free) on your behalf if you suspect fraud or other malicious activity. Here at BestFreePhoneLookup, we have articles for major carrier such as Verizon, Sprint, AT&T, T-Mobile and Rogers for our Canadian friends. If you have a suggestion for a carrier that we haven’t already covered in one of the articles mentioned above, please feel free to suggest one through our contact form here. Public Records are tricky to look through without having other pieces of information about your unknown caller. In most situations, the powerful search engines like LexisNexis are available only to lawyers and law professionals, and other medical directories from hospitals are only accessible on a need to know basis (but not always). It’s best to first check with the local court website of the phone number that called you and work from there. Court records usually have information about the parties involved, ranging from their full name and address, as well as their phone number and other contact information. If you’re lucky, you may be able to determine who called you from these directories depending on the sophistication of the court system. If you’re not sure where the caller is located, you can look up that information for free using a tool like PhoneDetective, which will tell you the city and state that the caller is registered in. This is a helpful first step in determining more information about your caller. The area code (if you’re located within the United States) is the first three digits of a phone number. You can find out what city or state a phone number is from by taking these three digits and visiting this page to match the first three digits with the state. Once you know the state the phone number is from, you can then use state-specific methods to lookup the unknown phone number, such as this method for Kentucky phone numbers. If you’re not located in Kentucky, that’s ok – because there’s always online phonebooks and white pages. Commonly, white pages and phonebooks are only available in physical form, but the truth is that many online services like yellowpages.com allow you to search the entire phone book (of each state) online. Many people in the modern age have a LinkedIn account that shows where they are currently working. Let’s say you have someone’s name, but not their phone number or other contact details – a good idea to find someones phone number on LinkedIn or similar job profile sites is to see if there is a public directory of employees on the employer of the person you are trying to find the phone number for. If a employee on LinkedIn works for XYZ Company, visit the website of XYZ company and see if they have an employee section or employee phone book – or even better, reach out to the company looking for an internal contact! Usually this is the best way to find the LinkedIn profile and they look at their job history, the recent jobs from companies on their profile will be the best bet to put into Google and search from there. Depending on the company, there may not be a public employee directory list, but you can always call their support helpline and ask for the person you’re trying to reach directly, they may have their own personal extension. Similar to the Spydialer option, you can use another phone like a payphone (if you can find one these days) or a friends phone to call the unknown number and find out who called. Additionally, you can use a free service if you don’t have an extra phone by using a service like Google Voice, which will give you a phone number of your own area code that you can use to make and receive calls. It’s essentially like having another phone at your disposal to use to call the unknown caller back, while keeping your privacy since Google Voice numbers are pretty much untraceable. That is one of the many benefits of a burner phone number, which there are many options besides Google Voice to choose from. You can also call your unknown phone number discreetly using an app on your phone from the app store, or by using the method to discreetly hide your phone number from caller ID by dialing *67 before you enter the full phone number of the person you’re trying to call. It’s an old method, but it works. Keep in mind that there are certain apps that can identify the phone number that’s calling even if you use this *67 method, but they are few and far between and it’s pretty unlikely that the person you are calling has the certain apps on their smartphones, or is using a smartphone at all. 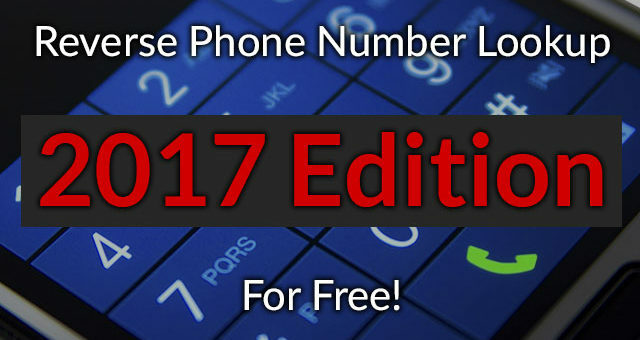 There are many free ways to go about reverse phone number lookups, but at the end of the day if you have exhausted all available options and have no other choice, it’s best to consult with professionals that can look up information about your unknown caller with more tools than are publicly available to you. If you have no other choice but to pay for a reverse phone number lookup, make sure you are using a reputable source that charges a one time fee for the lookup, or if you are looking up lots of phone numbers, has a fair cost monthly to use the service. BestFreePhoneLookup.com has new methods to lookup phone numbers each and every day! Make sure that you sign up for our newsletter and check back often to make sure that you are staying up to date with each method that becomes available.